In 1827 a small group of people settled around a bay, among them a newly wed couple Sonny and Matilda Dixon. The town soon began to grow due to its developing fishing industry. Local stores also began to spring up and for the first time people started cultivating the land. However, in 1836 tragedy struck when Sonny Dixon was killed in a whaling accident leaving his young wife, Matilda, a widow. After her husband´s death, Matilda became very close to the town´s children. She would tell them stories, give them gifts and when they lost a tooth she would give them a gold coin thus, they began to call her the "Tooth Fairy". However, a fire in her house horribly burned and scarred her face, leaving her disfigured, and giving her photodermatitis, making her capable of leaving her home only at night and while wearing a porcelain mask. But in 1841, two of the town´s children disappeared and the town quickly blamed the good-hearted Matilda. She was arrested, hanged by the neck with her mask removed, and then her body was burned. Soon after her death, the two "missing" children returned unharmed and the town realised the grave mistake they had made. A cover-up followed and Matilda´s body was quickly buried. A year later, the first of many strange occurrences began. In 1842 the supply of whales and seals vanished from the sea, their bones left on East Beach. Freak storms began to terrorize the town and often resulted in the sinking of fishing boats at sea. In 1844, the two children who Matilda had supposedly "kidnapped" left a suicide note at the town´s lighthouse. Their bodies were never found and it was as if the children had simply vanished into thin air. Nearly 10 years later, the local cemetery was moved to make way for local expansion. During the move Matilda´s body disappeared and was never seen again. Since then, children have mysteriously disappeared from Darkness Falls. Their bodies have never been found. Some say they simply ran away but other´s see it as yet another chapter of the curse of the Tooth Fairy a.k.a Matilda Dixon. And thus, the story of the "Tooth Fairy" was born. The vengeful spirit of Matilda Dixon would visit the home of any child in Darkness Falls during the night they lose their last tooth. If the child is unfortunate enough to lay eyes on her horrible form, she would whisk them off deep into the darkness and murder them, but her weakness in life remained with her in death, and extreme sensitivity to light, so much so that she can't bear but the darkest of conditions. One boy, Kyle Walsh, learns that the story is so much more than that on the night he loses his last tooth. He tries to fall asleep, but hearing the stories of Matilda made him wary and he takes a flashlight to bed with him. As he tries to sleep, he hears a raspy breath over his bed and dares to open his eyes, and sure enough, he sees the masked face of the Tooth Fairy herself. Startled, Kyle shines his flashlight into her eyes, causing her to recoil in pain. Kyle runs out of his room to his mother, who assures him that there is nothing to be afraid of. As Kyle´s mother goes to investigate, she sees the Tooth Fairy herself and is brutally slaughtered. Kyle, hearing his mother´s death locks himself in the bathroom, with the lights on, preventing Matilda from getting to him. The next morning, the police show up, and believing Kyle to have murdered his mother, arrest him and take him away. Years later, the story begins. 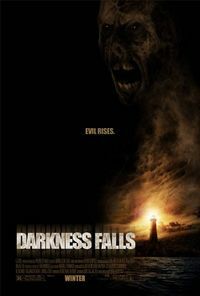 Kyle has since left Darkness Falls. He always carries a bag of flashlights and lanterns with him in fear that Matilda will finish what she started so many years ago. But a call from his old girlfriend, Caitlin Greene, brings him back to the town he wished to never see again. Caitlin´s brother, Michael, has survived an encounter with the Tooth Fairy himself, and now, like Kyle, has a fear of the dark and is thought to have gone insane. Kyle knows that Michael is not crazy and tries to help him, but two people that have survived Matilda´s wrath has caused her spirit to become more active, her drive to kill Kyle causing her to reveal herself to dozens of others and killing them as well. Kyle, Michael, and Caitlin now have to escape from Darkness Falls while avoiding the darkness till morning, just as one of the cities freak storms knocks out all the lights in the town.